Mom got a nice compliment at work yesterday. Her boss said that she was a lot of fun to be around. Mom said she owed it all to me. See, Mom learned from me that EVERYTHING is an ADVENTURE, and she changed her mindset to reflect that. That's the Life Lesson Mom learned from me. That's got to be one of my favorite pictures of Mom and I. It was taken 2 Christmases ago.. Mom would like to remind you that I weigh 70lbs. Not sure why that's relevant. It's been another busy week. Lots of rain so I don't go out for long. I don't want to melt you know. 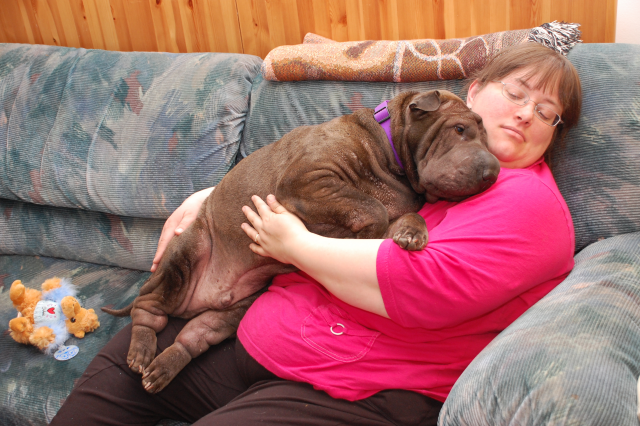 In case you missed it, Shar-Peis are made out of sugar, that's why we're wrinkly. Yup, that's Puppy and I actually TOUCHING. Puppy was sleeping, I was just thinking of falling asleep when Mom snapped the picture. We didn't stay like this too long. In other news, Auntie Sharon and Uncle Marty's Puppies are doing GREAT. I have it on good authority that Auntie Sharon has been telling the Puppies all about our family and that the Puppies want to meet ME because I give Nose Kisses, Snuffles and Secrets of the Universe. So they're in a hurry to get out of the NICU. I would be too. Nose kisses AND Snuffles? I'd be there. A few bad things have happened. My Grandma has been going for all sorts of testing lately. She was over yesterday so I had to give her MEGA cuddles. She could use some Power of The Paw if you have any to spare. Lastly, I seem to have been hurt. This might be a little gross for some people, sorry. Mom thinks I poked myself near the eye while chasing a squirrel. Didn't get the squirrel, but one more battle scar only makes me cooler right? That's my week in wrap up form. It's been a REALLY strange week. First of all, Dad has been home all week with me. This has been fun because I've gotten quite a few nice spontaneous walks. I like those. I don't know. They'd better take good care of him. That's all I'm going to say about THAT. There were more Noseventures for me this week. Including a trip to rescue Mom from work! I don't get to do those as often as I used to. Now I'm a little exhausted. I think I'll take a nap. 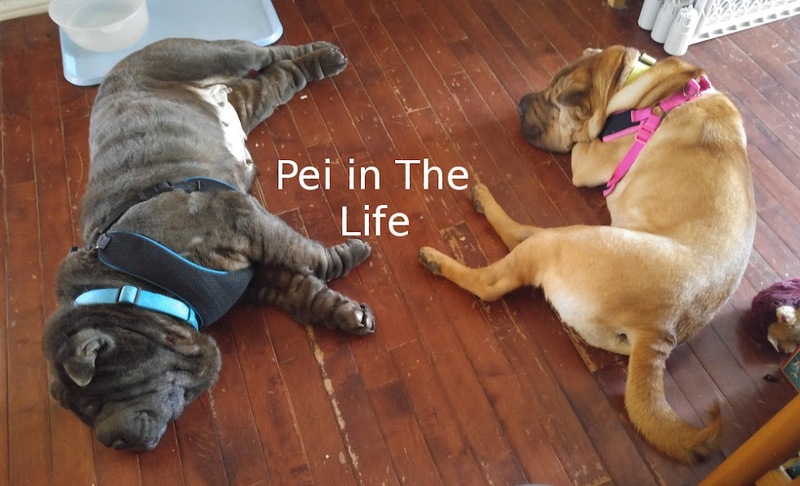 Pei-Ess Power of the Paw is needed for my buddy Hero Shar-Pei. He's recovering from bloat. Sounds like it was scary. I'm glad he's feeling at least a little better. Pei-Ess 2. 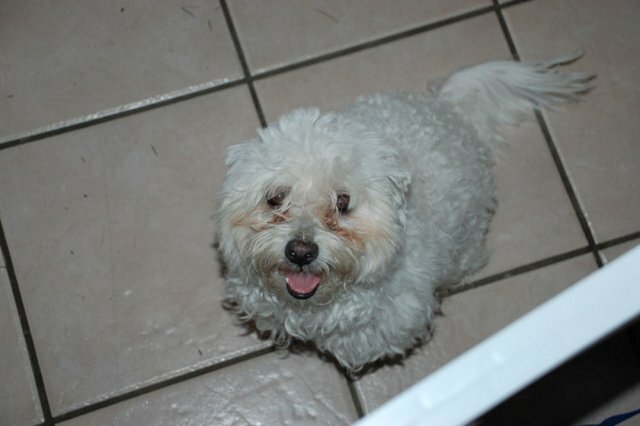 Mom says my Auntie Sharon had Puppies! They're doing well in the NICU, but if you have any POTP to spare, could you send it their way? Thanks! Mom's come downstairs a few times and said, "Where's Bolo?" It's not like I'm hiding or anything. I'm just very well camouflaged.